clever Fien in the Netherlands! Fien emailed me these cute creations and was so kind to allow me to show them off to all of you. The diagonal pink square, hanging in the middle, is one of the closet hanging sachets from this post. And the granny rose pattern can be found here. This project has also been added to the "CAL" page here. Nice job Fien and thank you for sharing! I would be scared to death to use those beauties I can see tomato sauce spread all over them! They're adorable! I love the idea of matching potholders too. Hmmmm... I was expecting to see a medal. :) But these are as good as any award! Super pretty and a great idea!! Thank you, for your sweet comments. Fun idea. 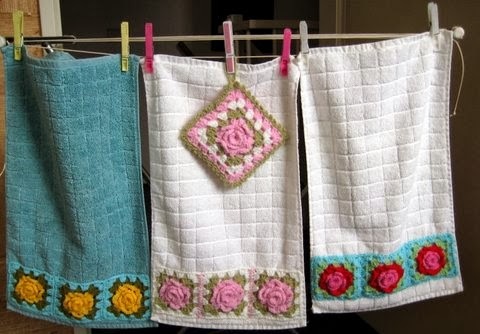 Never thought of using granny squares as a border on towels before. Thanks for sharing. Nice work using your rose pattern. I like her color choices too!